Foil pouch packaging. Heat seal foil bags and foil pouches for packaging medical products. 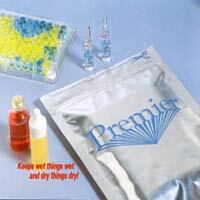 Heat seal foil peelable pouches; and custom made foil bags and foil pouches for medical foil pouch packaging. Custom printed heat seal foil medical pouches and foil zipper bags for medical packaging. Foil pouches that provide vapor barrier and oxygen barrier requirements. Foil bags for packaging medical products like: diagnostic test kits, wound dressings, sutures and disposable medical devices requiring vapor barrier protection. • Heat seal foil bags and foil pouches with zippers that maintain a hermetic seal. Depending on vapor barrier requirements, heat seal foil pouches are constructed of materials with two to four layer laminations. They have low MVTR, or moisture vapor transmission rate. Paper coated foil bag for mailing biological samples. This mailer is US postal approved. Flat heat seal foil bags for medical device packaging, zippered foil bag for packaging medial products and packaging diagnostic test kits. These medical pre-made heat seal foil pouches for foil pouch packaging are custom made. In order to get you pricing information we need details of the foil bag that you want such as: dimensions, what type of foil material, printing requirement as well as the amount of foil bags you will need. Heat seal foil pouches for medical products packaging. Foil pouch packaging. Custom made foil pouches and bags, and custom printed foil bags and pouches.